LAKE BUENA VISTA, FL - JUNE 21: Republican Presidential candidate, former Massachusetts Governor Mitt Romney speaks at the National Association of Latino Elected and Appointed Officials (NALEO) 29th Annual Conference on June 21, 2012 in Lake Buena Vista, Florida. 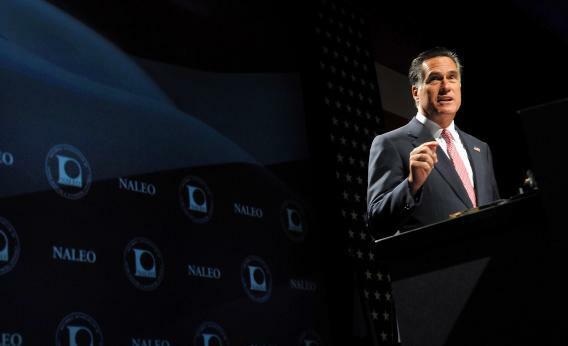 Romney spoke about immigration reform as he continues to battle U.S. President Barack Obama for votes. Mitt Romney still can’t seem to figure out how to respond to Barack Obama’s executive order ending deportation for the children of illegal immigrants. He gave a speech to the National Association of Latino Elected Officials yesterday, but while generally striking a milder tone than he did during the Republican presidential primary, he did nothing to clarify where he stands on the order and whether he would allow it to stand if elected. Dems have pounced on this, arguing that it shows Romney would, in fact, repeal Obama’s order — something Romney has not been willing to say. Will Romney really be able to keep dancing around this all the way until November? It would seem there’s a point where, for a candidate who wants the election to be about the economy and nothing else, Romney might as well get it over with and show his hand on immigration. What he’s doing now seems unlikely to please the conservative anti-immigrant base of his party nor the millions of Latinos frustrated with the status quo.